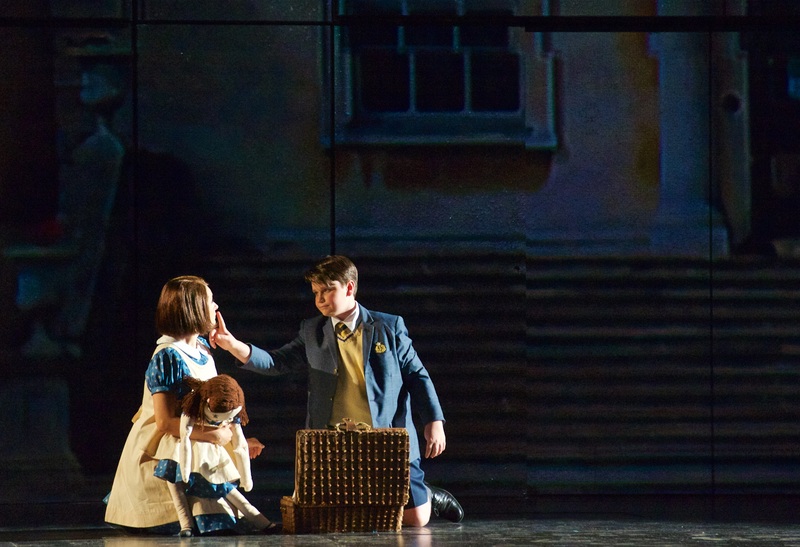 Soraya Mafi as Flora and Rafi Bellamy Plaice as Miles in "The Turn of the Screw" at Seattle Opera. Photo © Jacob Lucas. "The Turn of the Screw" began as a 12-installment serial in Collier's by the great American writer Henry James some 120 years ago. Often revised and reworked over the years by the author himself and others, it was adapted into a chamber opera (a dozen musicians) by the British composer Benjamin Britten in 1954, and that's what's playing at Seattle Opera this month..
A governess (soprano Elizabeth Caballero, who sang Donna Elvira here in 2015) hires on to take care of two orphaned children, 10-year-old Miles and 8-year-old Flora, in what turns out to be a haunted country mansion. The ghosts are Quint, once a valet at the property, and Miss Jessel, the former governess, who (just to complicate things) were also illicit lovers before their respective deaths. So what is true, and what is false? Should we trust the author and the composer to tell us what to see, let alone how to feel? As the evening goes by, the screw tightens, and the possible explanations get more and more grim. If you're into ghost stories, there's probably enough uncertainty and misdirection in this tale to keep you interested. On the other hand, if you're not a fan, there's Britten's atonal score to keep you awake. "The ceremony of innocence is drowned," they keep saying in the libretto. It's a line from Yeats's prophetic poem, "The Second Coming," followed by the famous couplet "The best lack all conviction, while the worst / Are full of passionate intensity." Yeats was writing about the period after the first World War, not modern day US politics. But maybe he's still with us, ghostly or not. The role of Miles is played by a boy soprano (technically a "treble"); in this production he's the BBC's Young Chorister of the Year. In the original production, back in 1954, the performer was David Hemmings, who went on to stardom in Michelangelo Antonioni's Blowup, a role he got because the director's first choice turned him down. That was a very young Sean Connery. Seattle Opera presents Benjamin Britten's "The Turn of the Screw" at McCaw Hall through Oct 28th. This page contains a single entry by Cornichon published on October 14, 2018 7:14 PM. Coming Soon: FORKING SEATTLE 2nd Edition was the previous entry in this blog. St. Clouds is closing down is the next entry in this blog. Vinmotion? Zirkle? Wahluke? Who dat?